O n April 20, 1999, at Columbine High School, 15 people died in the worst American school shooting ever. 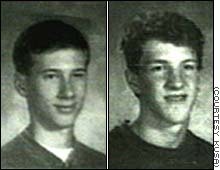 Eric Harris and Dylan Klebold, apparently after close to one year of planning, walked into their school, where they began shooting and exploding several homemade bombs. When the killing spree ended, with Harris and Klebold taking their own lives, 12 students and a teacher lay dead. What caused this terrible tragedy? One of the chief factors attributed to the Columbine shooting is the rise in easy accessibility of guns by teenagers. Internet technology is also being blamed, as Harris and Klebold may have learned how to construct explosives over the net. As well, violent video games, like Doom, are also being criticized for desensitizing teenagers to violence in modern culture. The shooting at Columbine High School is sure to intensify the debate over what is causing the rise in teen violence in contemporary America. Lastly, because the shooting took place on Adolph Hitler's 110th birthday, it is quite possible that issues of race had much to do with Harris and Klebold's motive. For more information on all these topics, see the additional internet resources I have compiled.